We Cooked Up Another Batch Of Smokin’ Hot Swag. Outhouse Designs was hungry to partner up again with Texas Monthly for their 2nd annual BBQ Festival, showcasing the top eats across the Lone Star State. 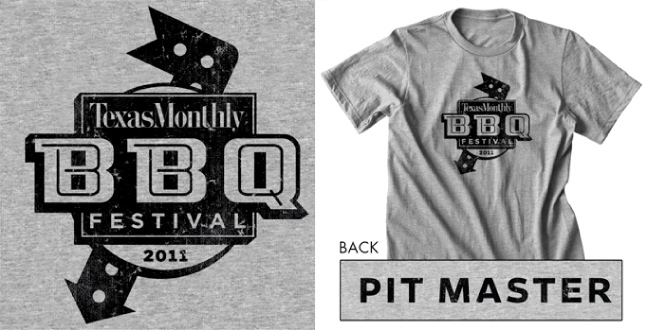 We cooked up another batch of smokin’ hot swag for this year’s event, including 2011 collectible tee shirts for loyal festival fans and the tee shirts proudly worn by the Texas Monthly Pit Crew. We also spotted our Salt Lick, Opie’s, and Shiner Beer designs in the crowd. Franklin’s of Austin may have won Best Brisket, but judging from the number of Outhouse Designs printed tees we saw sported from booth to booth, we were voted Best Swag Most Likely to Catch a BBQ Sauce Stain. See ya next year!